Sometimes I get sidetracked with blogging. I get stuck for ideas or I have a big project to complete. I get out of the habit and much too much time goes by. Well, here I am again with lots of things to write about. While I've been away I've been doing many, many things with needles, thread, yarn and a few adventures. Teaching classes at The Textile Center of Minnesota, a wonderful place has taken up some of my time. I've met some people with interesting things going on which I'll share with you in a later post. 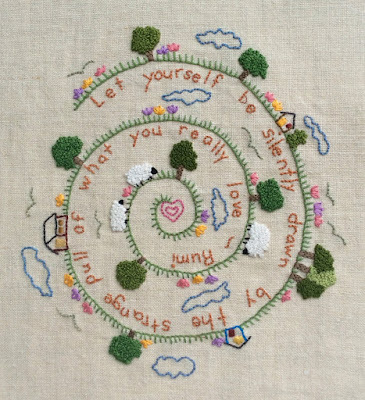 My newest creation is an embroidery that features a Rumi quote spiraling under a cheery landscape with trees, flowers, sheep and some tiny houses. The best part is you can make your own! I've put the pattern, called Rumi Wisdom, in my etsy shop and you can find it here. It is designed for a beginning embroiderer because it uses just a few basic stitches. Whether you are just starting out or a seasoned stitcher I think you will enjoy making this. I like this spiraling format so much I'm thinking of doing a series of these, perhaps one for each season.